In the new information from Yvette Hoitink at Dutch Genealogy, I discovered that Grandma’s grandfather was an orphan in Goes. When you’re the “current descendent” it’s easy to think of all the generations that came before as being unbroken links in the chain of each family name. But the reality is that sometimes the parents died before the children were grown. That’s what happened to my great-great-grandfather. Pieter Philippus Mulder was born on October 10, 1865 in Goes, Zeeland, the Netherlands. Records show Pieter living in the city orphanage in Goes on August 2, 1881. But how did this happen? Pieter’s mother Johanna Maria (Boes) Mulder died on November 19, 1867, when she was 32 years old. Pieter was only a baby at the time. He had two older brothers and a younger brother. His older sister Rose Melanie had died as a baby. Another baby was stillborn about six weeks before the mother passed away, so it’s highly likely that she died from the complications of labor and childbirth. At the time of Johanna’s death, Pieter’s father Karel was an apothecary’s assistant. Karel remarried a woman named Klazina Otte nine months after Johanna died. They had seven children. When Karel passed away on April 22, 1881, he was part owner of a family store (which I will write about in a future post). It’s unclear to me what happened to his estate. Would it go to his children? And, if so, to all equally or to the oldest only? Or would it go to the 2nd wife? Pieter and his siblings were now orphans. In 1881, the oldest child, another Karel, was 19 years old. The second oldest, Izaak, was 18. Their guardian was Krijn Wessels, a shopkeeper in Goes. He was married to their aunt Melanie Mulder. Pieter and his brother Adrianus, ages 15 and 14, were sent to live at the orphanage. Yvette thinks it’s likely that the maternal grandfather Isaak Boes (not a resident of Goes, but of Uzendijke, in southern Zeeland), a tailor, was the guardian for the younger boys. 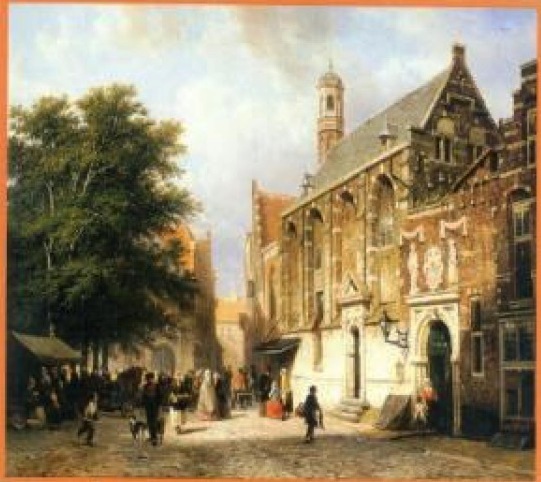 The city orphanage in Goes, where Pieter Philippus and Adrianus Cornelis Mulder were living, was created during the Eighty Years War (war of independence from Spain, 1568-1648), around 1600. The Reformation, which took place around 1578 in Goes, had left the convents obsolete. The war had left many children orphaned, so around 1600, an orphanage was established in a former convent. Orphans had to be at least three years old, from parents from Goes, and the child had to have lived in Goes for at least three years, be healthy and potty-trained. Religion was not a requirement, children went to their own churches on Sundays. Most boys were taught a trade, like carpenter, tailor or blacksmith. They would remain in the orphanage until they were 18 years old.2 These age limits also explain why the two oldest brothers did not reside at the orphanage: they had reached the age of 18. The following are marvelous photographs taken by Yvette Hoitink of the orphanage which still stands today. How did what happened to Pieter and his brothers fit into Dutch culture at the time? It sounds right that they had guardians who were not their stepmother, to make sure that they were taken care of properly. How could the stepmother have taken care of the boys as well as her own children? But then it also seems cruel that they were forced out of the home with their half siblings. And we can only imagine what the conditions at the orphanage were like. After leaving the orphanage, it’s possible that Pieter fulfilled his military duties, as that was a requirement. Then Pieter worked as a fisherman. At age 19 he married Neeltje Gorsse, who was sixteen years old. Since they were under the age of 21, they both had to have permission to get married. Neeltje’s parents gave consent, as did Pieter’s maternal grandfather. My great-grandfather was born six weeks later. Pieter and Neeltje had another son, Jan, a year later. 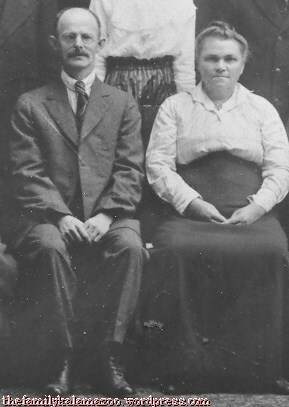 In 1887, when Pieter was 21 and working as a shoemaker, the couple emigrated from Kloetinge, where they were living and where their second child Jan was born–and moved to Michigan. Pieter and his one-year-younger brother Adrianus must have been close from being sent to the orphanage together. Yet, Pieter and his wife moved to Kloetinge not too long after getting married–and then on to America in 1887. Adrianus was left behind in Goes. He worked as a shopkeeper’s assistant. Unfortunately, Adrianus died on March 15, 1891, when he was just 24 years old. I wish I knew how he died. Here is a photo of Pieter and Neeltje, living in the United States. At this point, all their children were still at home, although fairly grown, including Charles who was their first-born in Goes and the others who were born in Michigan. Jan, who had immigrated with the family, died while he was still a baby, just after he arrived in the U.S. I wonder if Grandma knew that her grandfather had been an orphan. As for me, I was astonished to realize that Great-Grandpa Charles Mulder, a man I knew and loved, was the first-born and the only living one of that generation who had been born in the Netherlands. As I was growing up, it seemed that the family “began” with Great-Grandpa. Yet, as you can see from the photo above, he had parents who had lived their own interesting lives! It’s starting to amaze me the information available! The stories our ancestors had before coming to this country must be incredible–and mostly they didn’t pass them on to their children and grandchildren. You mentioned Johanna probably died as a result of complication of childbirth. This may be the case but often sickness and disease were the actual causes. In my family, we had a similar situation and for nearly 100 years we reported that my great grandmother died due to complications at childbirth. I was able to find her obituary and her cause of death was completely unrelated, she died of influenza with complications from diabetes. Just keep an open mind. Mrs. P, that is certainly a possibility, especially since the death wasn’t right at childbirth, but a few weeks later. Interesting how your family story wasn’t backed up by the obituary! No one had seen the obituary. The story was just assumed to be that way. It wasn’t until I did the actual research into the family that I discovered much of the actual history in newspaper clippings. I know the feeling that your family history began with your great-grandfather. . . I also had similar feelings when I began to research my family. And, I still don’t know much about my relatives prior to their emigration to the US. Unless you know the language where they came from, it’s difficult if you don’t have the help of a professional. If others have better ideas about that, I’d love to hear. on November 22, 2013 at 1:09 am | Reply Further memories | We dream of things that never were and say: "Why not?"